What happens when your opponent is 29 years younger than you? On Monday 29th May 2017 at the Liebherr 2017 World Championship, 12 year-old Rizumu Ono from Philippines, born to Japanese father and Filipinos mother, competed against 41-year old Olufunke Oshonaike from Nigeria in the Women's Single qualifications stage. Almost a three decade gap between the two, the fact that they played together at the global stage, is a true unifying force for the game, that age is no bar and table tennis is a sport for all. Rizumu Ono was born on 9th October 2004 and Olufunke Oshonaike was born on 28th October, 1975. 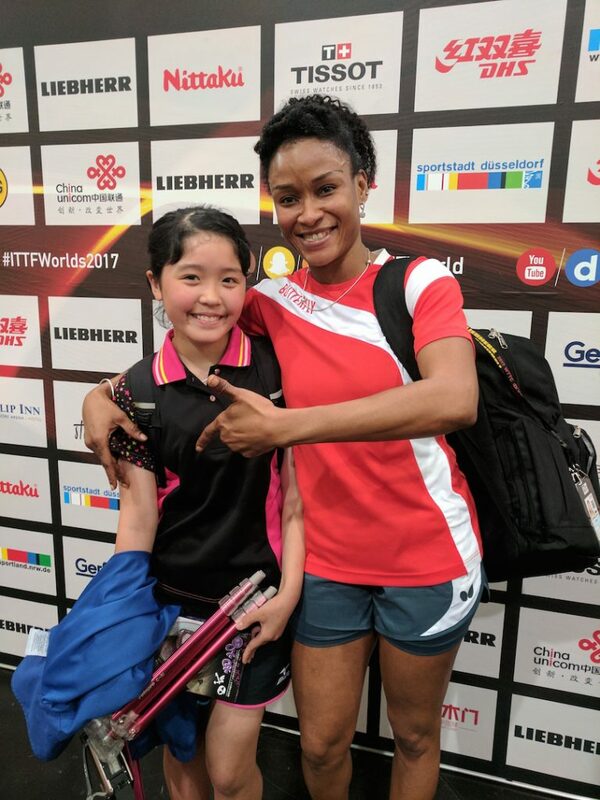 Olufunke Oshonaike beat Rizumu Ono in a thrilling six games encounter (15-13, 11-8, 12-10, 8-11, 6-11, 12-10) but the match and the situation was more than just the close scores. “I must tell you that I was really scared wondering what I will tell Nigerians back home, that a 12 year-old girl beat me without knowing that the girl is more talented than her age,” she continued. Olufunke Oshonaike is 41 years of age, and carries vast experience. She is a six time Olympian, and the only second African to achieve that feat. She has won a total of 12 medals at All Africa Games. Today, all that experience worked well for her. “When the match was 3-2, a lot of thoughts were going through my mind. I was just thinking that I should not lose to this girl and if at all I lose, I will not be able to make it to the knockout stage of the competition,” she said. “I thank God I stayed calm and the support from my German fans who travelled from Hamburg to support really helped me. But experience was the main secret that saved me from the talented girl. I believe I can now sleep well tonight and hope for victory in the next game to ascertain my place in the knockout round,” Olufunke Oshonaike admitted. Rizumu Ono has all the Japanese table tennis genes in her; her father is a Japanese reporter and mother is a former Philippines table tennis player. Rizumu carries dual nationality, but lives and trains in Saitama, near Tokyo, Japan. At Düsseldorf, she chose to play for Philippines, because she could take part in such a prestigious event playing for the country. She started playing table tennis at three years of age as her parents wanted her to play and has been training full time ever since then. Watch her play, she is certainly one of the most promising young players present in Düsseldorf. “I want to be at a level that Ai Fukuhara, Mima Ito and Miu Hirano are at. I watch them play all the time and really want to improve my game and follow their footsteps,” said the bubbly Rizumu Ono. “I love attacking, I am aggressive and that is how I would like my style to continue further. I have to choose one nationality once I turn 20 as per the official requirements, but I have a long way to go for that,” she added. Rizumu Ono will have a tough path if she wants to enter the Japanese national team, but given her talent and the hard work that she puts in, you never know. If not, Philippines will definitely reap the benefits!